The Pentagon has called on the Syrian government to reconsider its plans to launch attacks on Kurdish militants and allied US forces which have been operating in areas in northeastern Syria. 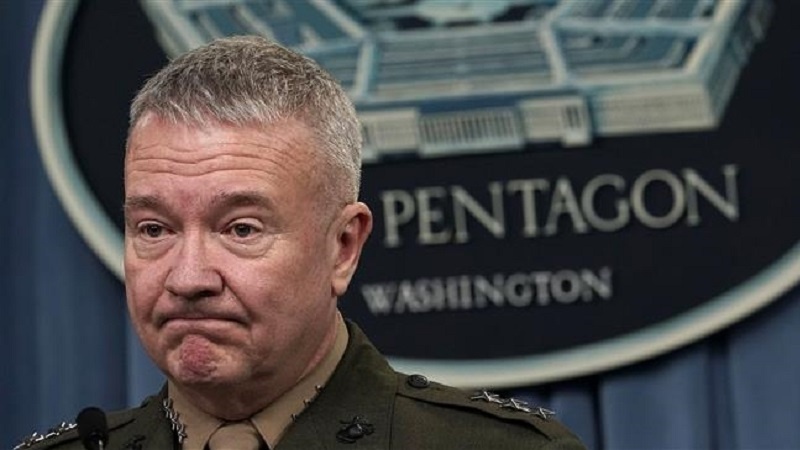 According to Press TV, Lieutenant General Kenneth McKenzie, Director of the Joint Staff, said on Thursday that Washington would deem it a bad policy for Syria if it attacked the SDF militant group, which enjoys massive US support. “Any interested party in Syria should understand that attacking US Forces or our coalition partners will be a bad policy,” said McKenzie during a press conference. The remarks came hours after Syrian President Bashar al-Assad said in a televised interview that the United States must leave the county as the Syrian people will no longer accept illegal foreign presence in the country. He also warned that the Syrian forces would not stand on ceremony to purge the country’s northeastern regions from militants, no matter who supported them. Assad said Syria had “two options” in dealing with the SDF, which he described as “the only problem left in Syria”, adding that if the Kurds and their allied militants refused negotiations, Syria would retake its territory back through force. “… we started now opening doors for negotiations. Because the majority of them are Syrians, supposedly they like their country, they don’t like to be puppets to any foreigners,” Assad told Russian broadcaster RT. “We have one option, to live with each other as Syrians. If not, we are going to resort… to liberating those areas by force,” Assad added. The US has deployed more than 2,000 troops to northern Syria near the border with Turkey, which Damascus has repeatedly condemned as a violation of its territory. Airwars, a non-profit organization based in the United Kingdom which tracks the international fight against Daesh, said earlier this year that more than 6,000 civilians had been killed in three years of the US-led war in Iraq and Syria. On Thursday, reports said at least eight people had been killed in a US airstrike in the Eastern Syrian Province of Dayr al-Zawr. The strike in Hejjin east of Dayr al-Zawr also left 17 people injured, many of them in critical condition. Later on Thursday, a spokeswoman of the Pentagon sought to clarify McKenzie’s comments about Syria’s threats to attack the SDF, saying the US had no responsibility to protect the SDF if it engaged in a battle with the Syrian government. Dana White said the US did not want to get involved in the war in Syria. The SDF, which enjoys both US and French military support, has on repeated occasions attacked positions held by the Syrian government forces east of the country. Syria, which has recaptured most of its territories from foreign-backed militants over the past years, has warned that it would ultimately retake territories under the control of the Kurds.